Moving into or out of an an apartment doesn’t have to be difficult when you rely on the trusted apartment movers at All Around Moving & Storage. 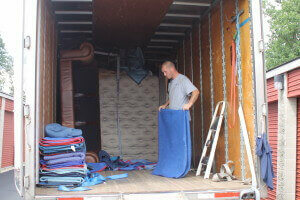 We take care of all the hard work for you so that you can focus on other important aspects of your move. Whether you’re on the first floor of an apartment building or you’re located at the top of a high-rise condo building, our apartment moving experts can help you pack, load, and transport items of all sizes. We use quality moving supplies to protect our customers’ belongings during the entire relocation process, and we always provide a complete inventory of all items to be moved so that you can have peace of mind in knowing that all details have been covered. Once we arrive at your new location, whether it be an apartment, a condo, or a home, our apartment movers will carefully unload and unpack your items and will even help you organize so that your new place starts feeling like home faster. In order to experience a stress-free apartment move, there are a number of things you can do. Group together all non-essential items so that they can be packed first. This will speed up the moving process and ensure that you don’t pack items that you’ll need before you move. Discuss your move with your apartment manager so that he or she is informed of your move-out date. Make sure to get back any deposits that you made upon moving in, and you should also contact your current utilities provider and your new utilities provider to make the transfer process easy. Make sure that you label any moving boxes or cartons that you pack clearly so that our movers will know the contents. This is especially true if you pack fragile or delicate items. Keep in mind that we also offer convenient portable storage solutions if you need a little bit of extra space before, during, or after your move. Our apartment moving team can provide you with affordable solutions no matter how much extra space is required. Contact All Around Moving & Storage for fast, reliable apartment movers who care about providing the best relocation experience possible. Call 734-941-2280 for a free quote.